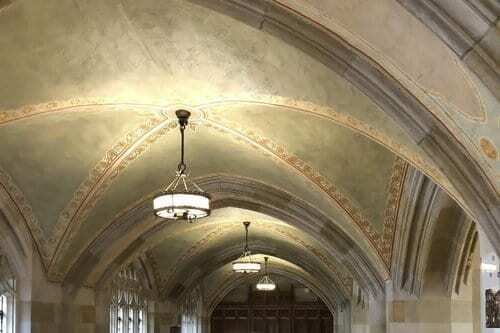 Sterling Memorial Library | Yale University | John Canning & Co.
Canning Co. conducted archival research, hands-on investigation, and interpretation to inform the conservation cleaning and restoration of plaster, wood, and decorative finishes designed by James Gamble Rogers. The Sterling Memorial Library is placed at the heart of Yale University, and was designed by James Gamble Rogers as a cathedral of learning. John Canning Co. researched and restored the woodwork, decorative finishes, plaster, and nave. The key component to this restoration was the conservation cleaning that took place on almost all of the finishes, to include the coffered barrel vault ceiling. This ceiling required a rottenstone treatment as specified by Rogers to achieve the effect of a weathered, fifteenth-century finish. Areas with new woodwork were also refinished to blend seamlessly with the original. Canning Co.’s work also included in-painting areas of loss, reinstating missing relief ornamentation, and conservation and restoration of the mural at the back wall of the nave. 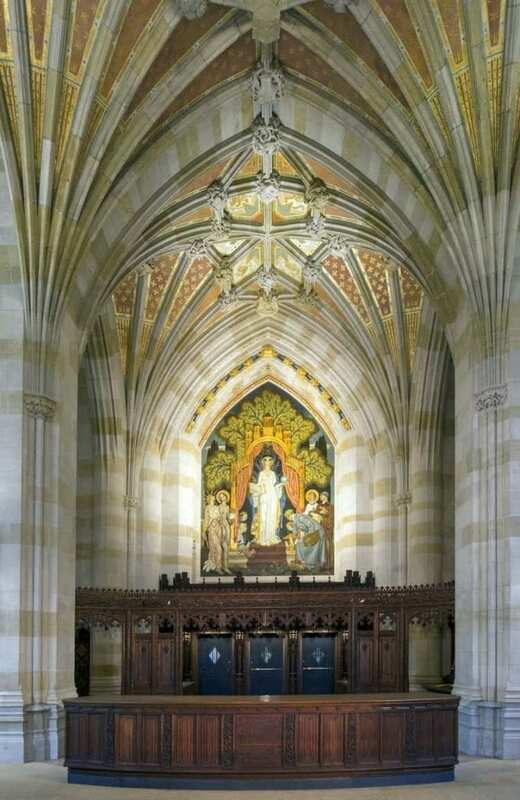 The mural, by Eugene Savage, is surrounded by allegorical figures and symbols to represent the academic schools.